Christiania is a autonomous enclave situated in a former military base in Copenhagen. The English version says "No photos - Buying and selling hash is still illegal", but the German version says "Please do not photograph the purchase and sale of hash remains illegal [sic]". The German version does not have the same meaning when translated against the English version. In fact the semantics of both versions invite questions. So what is actually illegal? Taking photos of buying and selling hash? If the latter, is it OK to take photos of other aspects of Christiania, like the architecture? Which of these meanings should the well-intended tourist adhere to? More importantly, who would arrest the tourist if they photographed an illegal subject in Christiania? Secondarily, there is an advisory against running, "Don't run - it causes panic" and in German "Please do not run, it generates panic". But there's no such rule against running in Copenhagen (that I'm aware of). What is special about Christiania that makes this rule necessary to the extent that tourists require a law/advisory? Note: Since I took the photo outside of the "border" to Christiania, I assume that I was not in breach, but would welcome any well informed confirmation of this. In the green light district there are 3 rules set by the community. Two of them seem strange and unusual, so they are given explanations. Have fun - no explanation needed. No running - explanation: because it causes panic. The key is the implied part. They can't just write "please do not create evidence of illegal activity that's going on here". Because that's pretty much asking to disobey a law that requires you to report a criminal activity. Why break the law openly if you can just evade it? Those rules are not law, they are community guidelines. The law is "selling hash is illegal". This law has to be coped with, hence the "no photos" guideline. Your translation is incorrect- the German text says the same. It would be clearer if the dash after photographing would not be missing, but that is a minor error. My understanding is that the real taboo of taking photos of anything related to drug dealing: vendors, customers, drugs, shops. While the act of taking a photo is not "illegal" according to Danish law, Christiania is famously self-governing. There is serious potential to upset people who do not want themselves or their (illegal) dealings to be recorded (because it could lead to prosecution), and they may assault you, break your camera, etc. Outside Pusher Street, photography is generally tolerated, but be polite and use common sense: ask people for permission, check with shop owners if it's OK, etc. 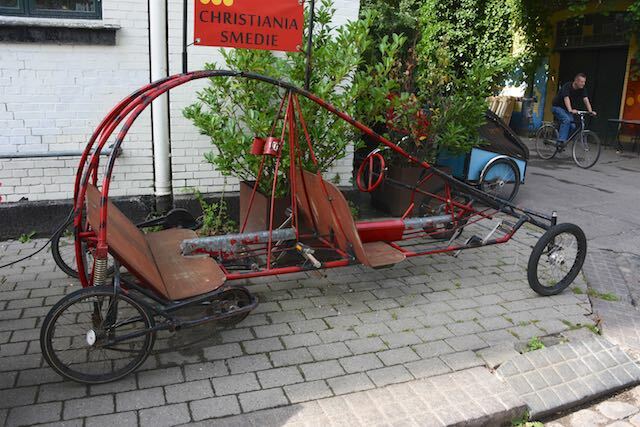 Likewise, the most likely reason for someone to run in Christiania is that the police are coming. Hence the prohibition: if some random tourist is sprinting to the toilets, others may think he is running from the cops and start running as well, and the dealers will not appreciate unnecessarily shutting up their shops. I visited Christiana last year and took one of the tours with a local resident (I can recommend the tour by the way). The rules on the sign in question applies specifically to the "Green Light District," also known as the immediate area around "Pusher Street," where drugs are sold. There are a number of prominent "No Photos" signs at the entrances to this area. The sign also has a map in the lower left-hand corner indicating where the small Green Light District is situated within the larger Christiana area. As I understand it, members of the Danish Police were entering Christiana undercover to take photos of the hash-sellers (who now wear ski masks, or they did last year anyway) as part of periodic crackdowns on the drug trade. Prohibiting photos helps protect everyone's anonymity. 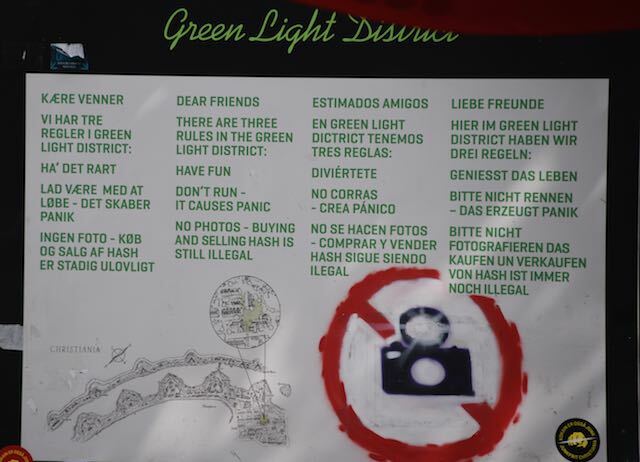 Running in the Green Light District is prohibited for the same reason: people have been known to run from the police there, and so if one person starts running, others may assume the police are present and start running too, creating a panic. In short, the rules, which are community norms, not laws, boil down to: "hey there's drugs around, everyone be cool." Not the answer you're looking for? Browse other questions tagged legal local-customs drugs copenhagen or ask your own question.